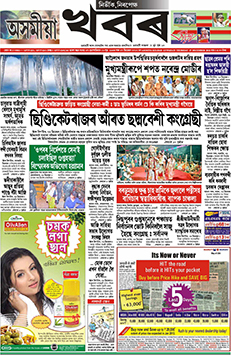 Asomiya Khobor (Assamese: অসমীয়া খবৰ) is an Assamese daily newspaper with its headquarters in Guwahati. The newspaper is owned by the Frontier Publication Private Limited. Asomiya Khobor is simultaneously published from two cities of Assam --- Guwahati and Jorhat, and Shankar Laskar is the Editor of the newspaper. Like the newspaper, even the Asomiya Khobor Epaper is also very popular. A colourful weekly supplement, which is called the Deoboriya Khobor is published every Sunday, and is distributed free with the newspaper.